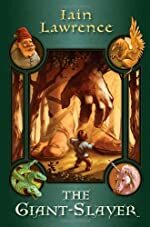 Review: Have you ever faced a giant who is 1,200 feet tall, while you are only 32 inches in height? This amazing adventure is being told by Laurie Valentine, to her new friends in the polio ward at the hospital. In The Giant-Slayer, (written by Iain Lawrence) Laurie’s one and only friend, Dickie, contracts polio, and she sneaks behind her father’s back to visit him while he is in an iron lung, a machine that helps his lungs breathe. She meets the other 2 children in iron lungs, Carolyn and Chip, and begins telling an amazing story about a giant-slayer named Jimmy. In the spring of 1955, Laurie meets and becomes friends with a boy named Dickie. They spend almost every day together, and one day they were playing in a creek. A few days later Dickie collapses with the disease Polio, and ends up in the hospital in an iron lung. There, Laurie meets two kids, also in iron lungs, and begins to tell a story to amuse all the children in the polio ward. As the story progresses, the kids seem to realize that each of the characters represent each one of them. This is a total coincidence, if not fate, and Laurie takes part as a character in the story as well. There is Jimmy the giant-slayer (aka James), Khan the unicorn hunter (aka Dickie), Finnegan Flanders the wagon man (aka Chip), the Woman (aka Laurie), the Swamp Witch (aka Carolyn) and Collosso the giant. But when Laurie falls victim to the unsuspecting polio and is in a coma, the polio kids fear that if they end the story themselves but in the wrong way, Laurie will die. How will Jimmy the Giant-Slayer’s tale end? Will Laurie survive her battle against the dreaded polio? The Giant-Slayer is a wonderful book, told with heart. There is evidence of great detail, and impressive imagination. The way Laurie’s story clashes with the children’s real lives is breath-taking - something very unexpected, but valued. I feel it is an important message to make the reader feel as if they are part of the story, to get a better understanding of it, and I think the author did a phenomenal job! Out of a 5 star rating, to be honest, I’d give this book a solid 5. It has become one of my favorite books, a treasure upon my shelf, and I’m sure, as the earth is round, that it will be one on yours too. This book is great for readers 10+, and is a great family read. I can guarantee you that everyone will enjoy the tale of The Giant-Slayer. We would like to thank Random House for providing a copy of The Giant-Slayer for this review. Have you read The Giant-Slayer? How would you rate it?